Colorado is one of the best places to visit during the winter months. With pristine snow and almost always sunny conditions, the winter months are not only tolerable but also beautiful. Now this state might be known for some of the best skiing around, but there are numerous other activities that can be done during the winter for those that aren't interested in hitting the slopes. No matter if you want to experience the cold from the comfort of a train or delve right into Colorado's powder by constructing the perfect snowman, these 15 best winter activities are sure to please anyone that visits Colorado this winter season. 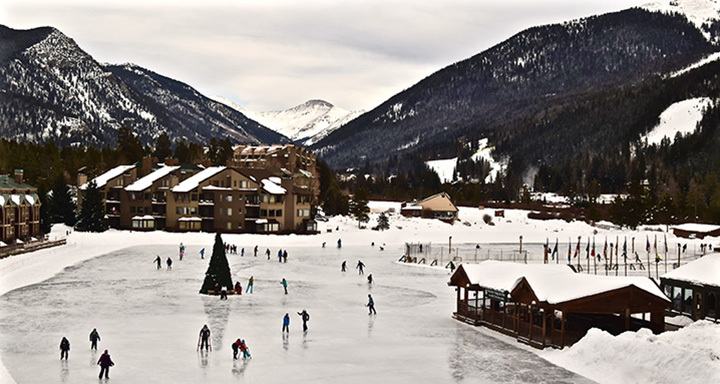 During Colorado’s winter months, Keystone Lake freezes over and becomes one of the best outdoor skating areas in the state. This five-acre lake has 12,000-foot mountains in the background and a large Christmas tree in the center, making for a very picturesque skating experience. This lake is the largest Zamboni-maintained outdoor ski rink in North America. Tubing, similarly to sledding but on an inflatable tube, is a great way to play in the snow. The city of Fraser is known for tubing. Home to the Historical Fraser Tubing Hill, known as the original tubing hill, Fraser is a two-hour drive from Denver. The slopes to tube down are well groomed and perfect for all ages and all skill levels. Lake Granby, a 7,250-acre lake, freezes over during the winter time and becomes a popular ice fishing destination. Fish for rainbow trout, brown trout and even salmon that swim beneath the ice. Lake Granby became popular among ice fishers because it is one of the lakes included in the Three Lakes Ice-Fishing Contest that happens every January. Although there are numerous places to go snowshoeing during the winter months in Colorado, Copper Mountain offers free, guided snowshoe tours, making it perfect for the beginner or anyone new to Copper Mountain. The three-mile, three-hour tour toward Vail Pass is a perfect way to experience the snowy weather at a slower pace. Tours are offered daily. Nordic skiing, not to be confused with alpine skiing, is the act of traveling on skis on typically flat or mild terrain. Nordic ski bindings are different than alpine ski bindings. The bindings on Nordic skis allow the heel to rise, making climbing up in elevation possible. Also referred to as cross-country skiing, Nordic skiing is very popular in Colorado. There are numerous areas to Nordic ski in Colorado, but Devil’s Thumb Pass in Tabernash has become one of the most popular cross-country ski areas in the state. A great way for the animal lover to enjoy winter scenery is to go dogsledding. Alpine Adventures Dogsledding in Leadville is one of the most popular places to experience dogsledding in Colorado. Alpine Adventures also serves as a rescue facility for sled dogs. Steamboat Springs and its adjacent areas have some of the best snowmobiling terrain in the state. Due to the expansive and rideable terrain, riders of all skill levels will feel comfortable, especially near Rabbit Ears Pass or in Routt National Forest. Steamboat Snowmobile Tours is a company that takes the guesswork out of snowmobiling by providing tours, gear and a free shuttle from popular resorts in Steamboat Springs. With 25 ski resorts in Colorado and lots of backcountry terrain to ride, Colorado is a great destination for the skier and snowboarder. Large ski resorts reside in Colorado, but Vail is truly one of the most popular and well known. With seven back bowls and well-groomed runs on the front of the mountain, both skiers and snowboarders at any level will enjoy the terrain at this ski resort. Vail has over 5,289 acres of skiable terrain and offers 31 lifts, three terrain parks and gets over 300 inches of snow a year. Now Colorado's winters are notorious for pristine and powdery snow. Snow can be found nearly everywhere in the state during the chilly months, but Wolf Creek Ski Resort in Pagosa Springs receives more snow than any other place in Colorado at over 400 inches a year. A snowman can be built anywhere with snow. However, Wolf Creek's snow at Wolf Creek Ski Area is all natural, not manmade. The area of Wolf Creek is sure to provide the best snow to build the perfect snowman this winter season. The Pikes Peak Cog Railway, the world's highest cog railroad, will take you up to the famous Pikes Peak, a 14,000-foot mountain near Colorado Springs. This railway is open year-round for visitors, but winter is a great time to take this train ride. During November and December, enjoy the Christmas-themed train where you can catch a glimpse of St. Nicholas, meet the crew from the North Pole, socialize with Santa's elves and enjoy hot chocolate against the snowy scenery. Biking has become a popular activity among Colorado residents, and the snow doesn't stop bikers from enjoying a great ride. A fat tire bike, an off-road bike with wide, thick tires, makes it possible to bike in snowy and icy conditions. Since the tires are wider, they provide more traction than a regular bike, making it perfect for Colorado's powdery snow conditions. Denver, Boulder and Fort Collins are the top biking towns in Colorado. Hit up any of these destinations to rent fat tire bikes and find guided tours. The Winter X Games is held in Aspen every January. Although tickets are required for the nightly concerts, sport competitions are free and open to the public. View some of the greatest athletes compete in winter action sports such as skiing, snowboarding and snowmobiling. From late January to early February Breckenridge hosts the International Snow Sculpture Championship. View incredible works of art made entirely of snow. Artists use only hand tools to create impressive sculptures that start out as a 12-foot-tall, 20-ton block of snow. Typically, it takes artists five days and a total of 65 hours to sculpt the snow into unbelievable works. During the holiday season, a gorgeous array of holiday lights can be found in Denver at Denver Botanic Gardens. Known as Blossoms of Lights, the garden is illuminated with glistening and vibrate lights portraying animated scenes. Since plants don't thrive during the winter months in Colorado, this is a great way for the plants to come back to life with light. Enjoy the lights annually from Christmas Day to Jan 2. A hot spring is a relaxing way to enjoy the chilly outdoors in Colorado. Although the temperature outside may be well below freezing, a hot spring stays nice and warm year-round. There are numerous hot springs to visit in Colorado. However, the hot springs pool in Glenwood Springs is one of the hottest natural hot spring pools in the world.